A reminder that Agile Staffordshire is meeting up tomorrow at Staffordshire University for the Lean Code Challenge. As usual, details are available on the Agile Staffordshire Blog and you can register your attendance on Meetup.com. I will be there and I hope to see you there too! New members are always welcome, it is a good opportunity to network with industry and academia. There is a special event this month at Agile Staffordshire. Guest speaker @pezholio presents an introduction to the Open Data Institute. Please feel free to come along and join in. Details can be found on the Agile Staffordshire site. Author TrevorPosted on December 24, 2013 Categories PersonalLeave a comment on Alan Turing – Pardon Me? I have yet to fully ‘come-down’ from Brooklyn Beta. The come-down started the moment I walked away and it was intense. I had just experienced three days of cerebral stimulation and energising company. Walking to High Street station was ‘cold-turkey’, sobering and sombre. The sombre mood ebbed as the A-train took me North towards 185th Street. I felt privileged, energised and optimistic. I have a lot to consider. Enough about me, for now. What about Brooklyn Beta? When I think of industry conferences, I am often reminded of commercials and big unveilings of things you sort of know about already. Brooklyn Beta is a conference, the way a conference should be done. Brooklyn Beta brings many creative and technical individuals together in a friendly and a surprisingly, given 1300+ attendees, intimate atmosphere. Personally, I wanted to spend some time with some top designers and get a feel for the design process. I was not disappointed, and I met a wider range of web types too! I will not review the talks because others have already done so, particularly in the form of sketch notes. Check out @evalottchen‘s Flickr and Elyse Viotto‘s Blog – particularly for the beautiful and practical sketch notes of the event (I am envious). 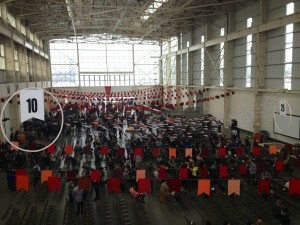 The setting for Brooklyn Beta was the Duggal Greenhouse, Brooklyn Navy Yard, which is a grand edifice, sporting a spectacular view of the Williamsburg Bridge (inadequately captured by my phone). 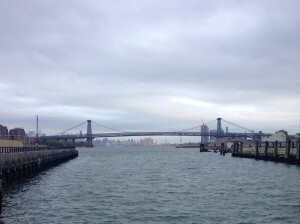 View of the Williamsburg Bridge from the Duggal Navy Yard, Brooklyn. I was privileged to attend a series of talks and activities over the Wednesday and Thursday prior to the main event. The Invisible Dog Art Centre is located in Brooklyn, New York. A wonderful little venue that lends itself well to the Beta crowd. There was an art exhibition on display during the event. Approximately 300 people attended the art house and were treated to a variety of talks, demonstrations and local cuisine. All this against the back drop of Brooklyn, in an area that appears to be going through a renaissance. The neighbourhood is a friendly and vibrant place with oodles of character and charm. Brooklyn is a wonderful place to walk. Street walking with a ‘coffee-to-go’ is a personal favourite. There were a number of things to discuss, some of which I am honour bound to not discuss (love the term FriendDA). The highlights for me were David Marquet‘s talk on leadership, Cloud Typography by H&FJ and a visit from Code Club co-founder, Clare Sutcliffe. A real treat for me at The Invisible Dog sessions were the generous break times, including coffee, with ample time to talk with other attendees. Change working environments as explained by David Marquet. Practice sketching for the purpose of note taking – this will be a huge challenge for me. Tackle my code clubs with renewed vigour, concentrate on enabling the material resources. Consider design workflow and integration into current and future software development projects. If you’re a developer, designer or other form of web professional – visit Brooklyn Beta! To everyone with whom I shared some time and a drink, thank you! Camera Photo of Brooklyn Beta 2013 Main Event. It’s Agile Staffordshire time. Check out what’s in store tomorrow at the Ale House in Stafford. I’ll be there from about 18:30 for Pie and chat. Author TrevorPosted on December 25, 2012 Categories PersonalLeave a comment on Merry Christmas!